Iona Blog : Sitting waiting wishing... The Spooky Edition. So how is everyone? Feeling in the spooky Halloween mood anyone? I'm desperately in search of a costume for next Wednesday, I want it to be scary not slutty, but not crazy expensive... so on a bit of a hunt for ideas at the moment! I'm heading out in Edinburgh with my lovely friend Kate and her flatmates, then the next day we're heading to Amsterdam! I'm so excited! Anyways in the mean time it's Halloween, I've compiled a little Halloween themed wishlist/ things I think are really cool! Anyways I best be off as I'm headed to the hairdressers this afternoon. 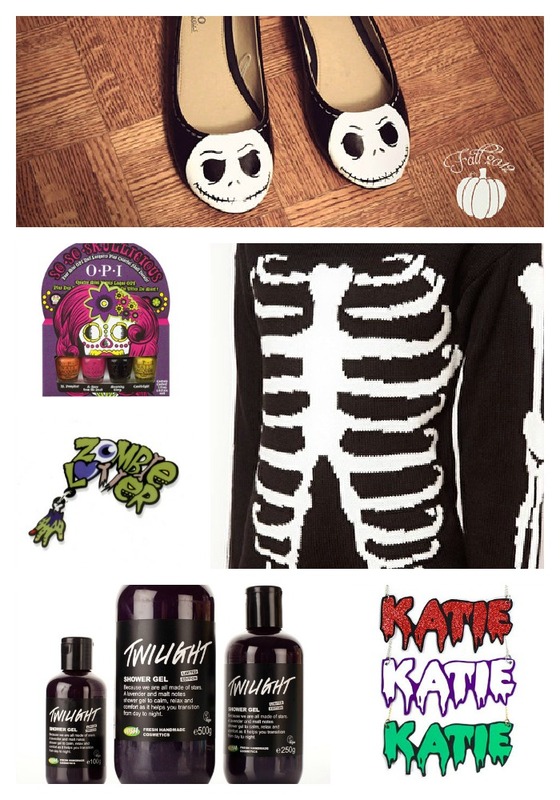 Top; Jack Skellington hand painted pumps source, I'm such A Nightmare Before Christmas geek, so love these! OPI 'So Skullicious' (source) nail polish set; these colours are so bright and pretty! ASOS Skeleton jumper (source) I think this would be amazing to wear all year round, forget just for Halloween! Lush 'Twilight' shower gel, (source) I love Twilight bath bombs they smell amazing, so I'm super keen to try out this shower gel, it has such a relaxing scent perfect for cosy nights in. I have wanted a personalised name necklace for years, (source) I'd love the glittery red one a perfect mix of spooky and sparkly :) these ones are from Heidi Seeker. those little shoes are sooo cute!